To transform B. subtilis with our developed biobricks we have improved the amyE intergrational backbone from Munich's iGEM team 2012 (BBa_K823023) that had no inducible promoter. We've added the HyperSpank IPTG inducible promoter from Rudner's Lab 2004. This promoter is placed right in front of the prefix, so any biobrick can be inserted in this backbone (BBa_K1085014) and can be induced with IPTG. In figure 1 a close-up of the promoter is shown. Figure 1: The HyperSpank promoter with in orange the lacO operators, in red the -35, -10, +1 signals and in green the prefix. Figure 2: BBa_K1085014 with: The amp gene for ampicillin resistance in E. coli; The cat gene for chloramphenicol resistance in B. subtilis; The HyperSpank promoter with its repressor lacI; The amyE up- and downstream fragments for intergration in the amyE locus. BBa_K1085014 was constructed with two variants of GFP (one form our group and one from the biobrick system, BBa_E0840). BBa_K1085014-GFPmg and BBa_K1085014-BBa_E0840 were transformed to B. subtilis. Overnight cultivated strains were diluted 1:100 in fresh medium and grown till OD~0.45 and induced with 1mM IPTG. A 1,2 and 3 hour sample was analysed under the microscope, results are shown in figure 3. 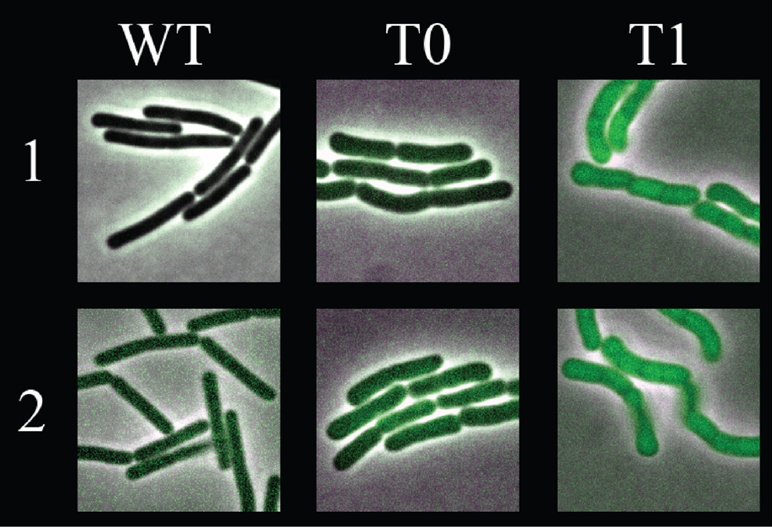 Figure 3: In (a) An overlay picture is shown from the phase-contrast and GFP-channel picture. 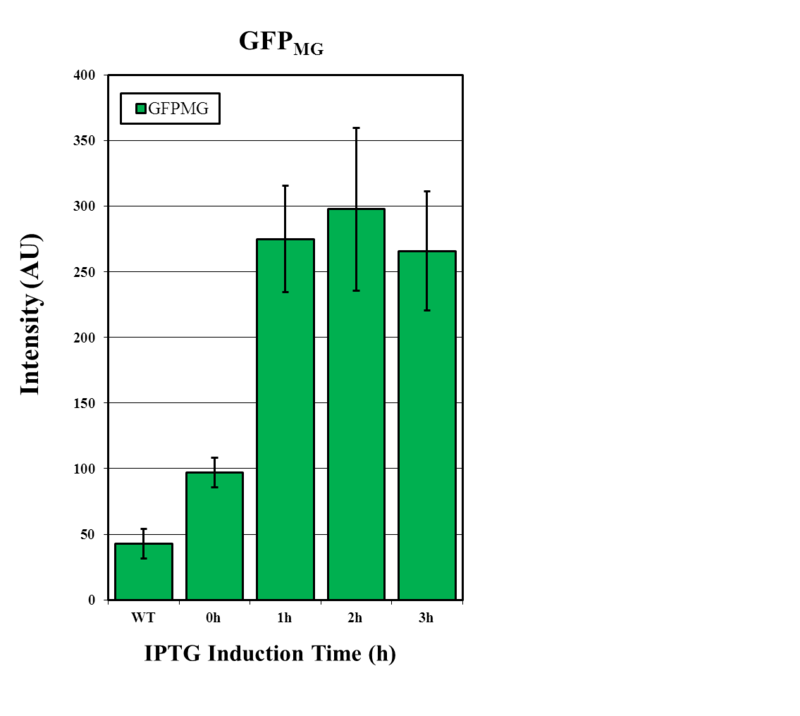 In (b,c) the intensity in of ~40 cells in the GFP-channel, were analyzed from two pictures. The average intensity (AU) from the cells are plotted above with the standard deviation. 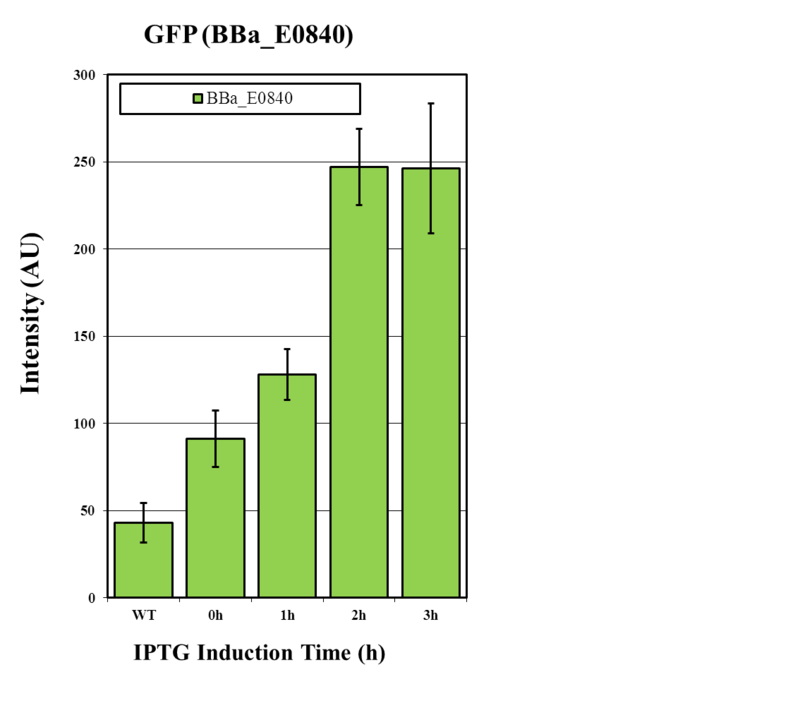 In (b) a GFP from our group is shown and in (c)a biobricked GFP (BBa_E0840) is shown in a plot. wt=wildtype, T0= before induction, T1,2,3=#h of induction with IPTG.